Today we thought we would look at the different Enzie Spiral Stair models, their popularity, their differences and uses. Coming in at number one – still the most popular and most requested Enzie Spiral Stair Model is The Classic Model Spiral Stair. 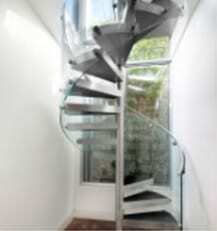 Value for money and suited to all environments the Classic Spiral stair has proved the test of time. This award winning patented Enzie Spiral stair model is designed with clean lines that compliment both a modern and a traditional decor. With the flexibility of being able to mix timber, glass combinations with both powder-coated steel and stainless steel finishes, allows customers to design a stair that fits with their individual needs. 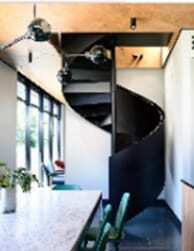 The Enzie Universal Spiral Stair Series currently comes a close second to the Classic Series. The Universal Series offers an unparalleled range of options across both the Tread designs and the finishes. Giving the customer the ability to mix and match a combination of Tread finishes, five different balustrade designs and numerous finishes, including a Glass Tread and a Glass Balustrade. This series also works well with Privacy screens, solving the challenge that can be created if you stair allows you to looking into the neighbours property. 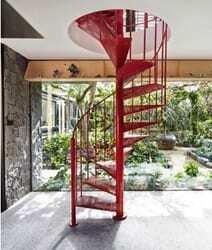 The Helical Stair is definitely an architectural statement piece. With its sculptured elegance and sweeping curves, the helical stair gives the appearance of seamlessly floating and flowing from one floor to the next. This stair is not limited by size, and can be used as the main stair, as the stair tread design allows for two way traffic in virtually any size. Again like all of our series the customer has a wide range of materials to choose from. With a closed riser design and an enclosed aluminium wrap balustrade, the Z Tread offers a more substantial solid looking stair. In this series the tread can be covered in almost any covering both top and bottom. With an enclosed balustrade, that highlights the form of the spiral, creating a sculptural form that can be used to partition or even divide a room. Enzie Stairs and the different Stair Treads on Offer 10 Reasons To Choose An Enzie Staircase.